Spacious Country House near Ombersley, Worcestershire, England. Elegant modern country house with large garden and hot tub. Pet friendly. 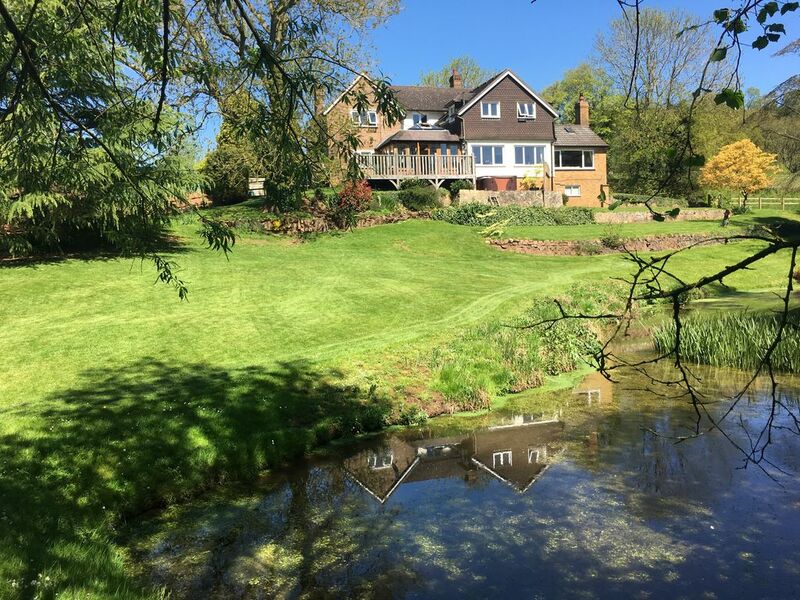 Winnall Springs is an modern, spacious, country house set in approximately 1 acre of gardens with natural, spring-fed pool. It has beautiful views from every window, and looks out over rolling Worcestershire countryside towards the Malvern Hills in the South. There are wonderful walks (many off-road) locally, Ombersley Golf Course is approx 1.5 miles away, and the pretty riverside towns of Stourport-on-Severn and Bewdley are within very easy reach. You may also be interested in trips on the Severn Valley Railway, or visiting West Midland Safari Park which are both nearby. Lincomb Equestrian Centre and Orchid Spa (massages and beauty treatments) are a short walk along the quiet lane from the house. A maximum of two well-behaved dogs are welcome at a small extra cost. The house is very well presented and equipped to a high standard having recently undergone extensive refurbishment. A large hot tub is placed adjacent to the raised rear decked area to take advantage of the views. The oak-framed Orangery is perfect for relaxing, whilst the large open-plan kitchen is a particular feature, having all Miele appliances and an Aga positioned in the centre island. The sitting room has a log burning stove with wood provided free of charge. There are two cloakrooms on the ground floor, a boot room, laundry room, and dining room. The study has a pull-down double bed. Four bedrooms are located on the first floor; bedroom one is a large room with king sized double bed, TV, and ensuite bathroom; bedroom two is spacious and has a double bed and ensuite shower room with WC, it also has a large kiddies den with TV and games console, and various other toy/games: bedroom three has double bed with ensuite shower room with WC and TV; bedroom four has two single beds and benefits from use of the house bathroom. Free wi-fi is included, together with Freesat TVs in the sitting room and orangery and Freeview in the bedrooms. Use of the PC in the study is included. All bed linen and towels provided. A travel cot and high chair are available upon request (please bring your own cot bedding). You are welcome to meet our own ponies which are stabled close to Winnall Springs. NB Whilst children are very welcome we would advise close supervision at all times due to the unfenced natural pool, and hot tub. Nespresso coffee machine. Cafetière also available. Televisions in Living room and Orangery. Also televisions in bedrooms 1 and 3, and in children’s den. Children's Den off Bedroom 2 with TV and games console. Approximately 1 acre of garden, with spring-fed pool and large area of lawn. Pools adjacent to garden available for fishing. Raised decking with seating off Orangery and steps to hot tub and lawn. Ombersley Golf Course approx 1.5 miles from property, with restaurant and bar, open to non-members. Lage Hot Tub (seats up to 8) with lights and three pumps to give relaxing or invigorating experience. Beautiful views. stayed over the weekend, with 10 adults, month old baby and family dog. celebrating youngest daughters 30th birthday. its a huge house in a very quiet area. plenty of places to visit nearby if that's what you are after, or like we did just hang around the house and grounds. while away an early evening hour watching "robbo" the lawn mover make its way around the garden, lap after lap after lap. the house itself had everything we needed, from the very large kitchen with top quality equipment and an AGA which kept everywhere nice and toasty, to the 2 sitting areas 1 as a "orangery" attached to the kitchen and at the other end of the house, a well presented and equipped other. wasted sunday afternoon having some sporting contests on the Wii in there. large dining room with a table big enough for all of us ;easily. or eat in the kitchen area.plenty of room as well. there are 4 good size bedrooms upstairs , 3 which are ensuite. and a good size family bathroom. the 5th bedroom is downstairs where the study has a pull-down double bed, which we used to keep the dog from upstairs, as well as 2 cloakrooms downstairs. lovely views of the garden from the hot tub and veranda area, could sit out there all night. lovely present of a card and cake left by the owners for the birthday girl, as well as 2 bottles of wine, apple and orange juice and a bottle of local milk in 1 of the 2 fridges, and a welcome hamper. to sum up, if you're looking for somewhere to relax or celebrate an occasion , in a quiet area with everything you would need, you'd be hard to find a better place in Worcestershire. Again many thanks for everything Sandie. Amazing property home from home. What can I say about this property, it's clean, it's large, it's amazing, we booked this property for a 40 birthday celebrated. The location is set in an area of outstanding beauty, surrounded by farmland and horses, so peaceful. The house is fully equipped with everything you could ask for. The owners Sandie and Richard had supplied us with a welcome hamper, dog treats and dog tags for our stay. Every room is decorated beautifully. The kitchen had all the facilities we needed including an Aga. A gas barbecue outside the back yard. If I have known that there was a fishing lake within walking distance from the house, I would had brought my fishing rods? "Maybe next time". Thank you to Sandie and Richard for such a wonderful stay. We had such a lovely few days at Sandie and Richard's fabulous home, it is just as described - in fact even better! We were 3 generations, a family party of 6 adults and 2 children under 3. The house is beautifully maintained and super clean, Sandie provides many thoughtful touches to her house, including a lovely Welcome hamper which was particularly nice as it included prosecco and cakes for my husband's 60th birthday and we felt instantly at home. The garden was great for our two dogs who ran themselves silly, it's fully enclosed and sitting on the decking gives such splendid views. The whole property is fitted out with quality furnishings and finishes and the kitchen provided a great space for us all to enjoy much food and drink. A huge dining room is also available and we had our Sunday lunch in there overlooking the garden. Despite its size the house still manages to feel cosy, warm and comfortable and we would thoroughly recommend it to family and friends wishing to spend a few days together with plenty of room. Sandie was really great with communication and also on hand if we needed anything, she even arranged for my granddaughter to meet the their horse Sparky and Shetland pony Elmo. Thanks Sandie and Richard for a special weekend. This was the base for my 70th birthday celebrations with family and friends. A superbly appointed house with space for all to enjoy. The birthday cake and wine were a lovely touch, along with the thoughtful welcome pack and fridge essentials.